Rozbitek | Pilchner Schoustal International Inc. 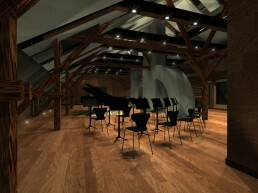 This project involved the adaptive re-use of a castle under restoration in Rozbitek Poland. The facility is being tailored to house film projects under development, and is the center point of a film festival in the area. It is partially funded by EU grants. It is founded by film composer Jan Kaczmarek who is an Oscar and Golden Globe winner for the music of Finding Neverland. The upper two floors of the building (from the roof line up) is being purposed as a symphonic recording space with composition suites, a machine room and a main audio control room. The project presents many challenges working within the context of the building type to provide all modern conveniences and life safety systems. A great deal of time was spent developing the sound isolation of the primary shell and in providing an NC-15 mechanical system to service the record space. The rendering of the control room shows how it was developed to occupy one end of the upper floor. The room features a 5.1 PMC monitoring system and an SSL duality console. The room is entirely dynamically separate from the structure. The idea is to work within the context of the roof structure and integrate the necessary acoustics and ergonomics to provide a modern and functional space that respects the unique historic qualities of the castle. The bulk of the room volume has been purposed as the record space. As this is an old castle, every room below has a separate fireplace, whose chimney penetrates this space above and connects to a series of main chimneys. These chimneys are being finished, lit, and featured in the design. 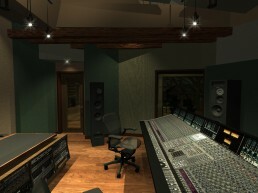 The rendering of the studio space shows about 1/3 of the available area for the record space. 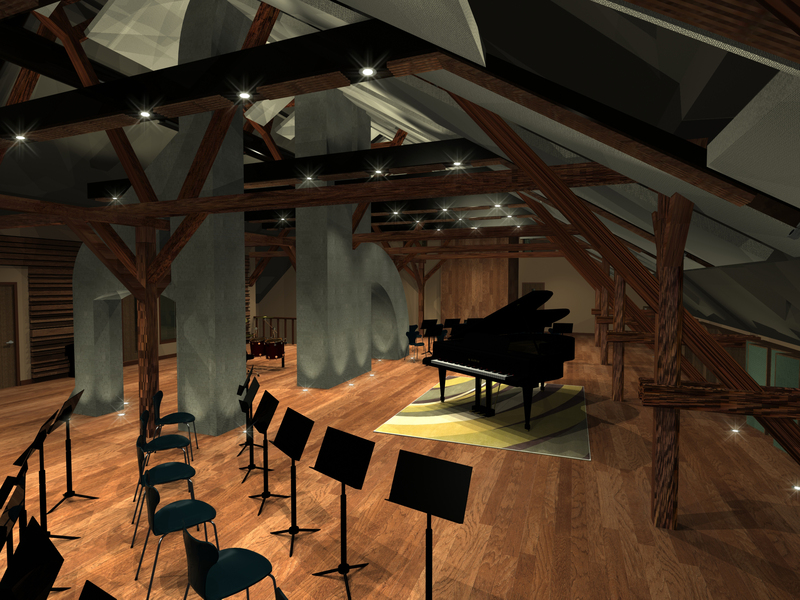 Video projection is also key as this space will be used for scoring to picture, with two local orchestras. The castle proper will be used to house artist in residency programs. Our role in the project is the overall design of the studio proper and ancillary spaces. This includes the mechanical and electrical systems and the audio integration. 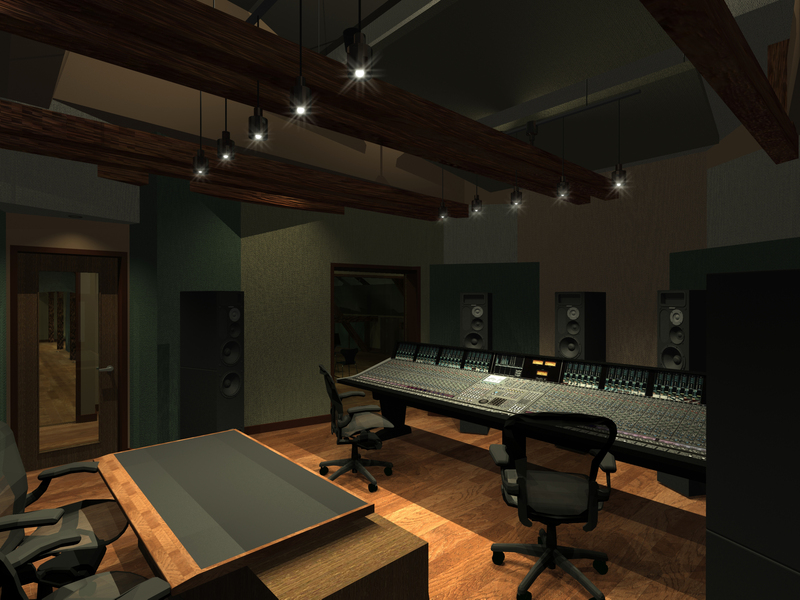 Our job is to ensure the finished product is a fully functional, well thought-out, modern production space.